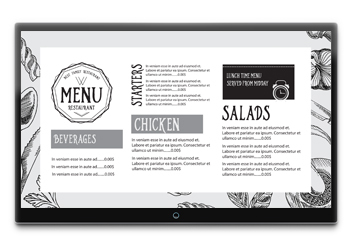 Replace Your Old & Outdated Static Menu Boards! PItch Digital Media can provide your business with a high definition menu board that will not only increase the attention your menu will get, but also drive sales. Pitch Digital Media can schedule your menus to change throughout the day to showcase your menu for breakfast, lunch or dinner! Fire char-grilling a burger, steam from a hot tea or light glistening off a crunchy leaf of lettuce. However you want us to make your menu stand out we can do it. Digital motion menu boards are proven to capture your customer’s attention and hold it longer. Contact us today for pricing on your new digital menu board!